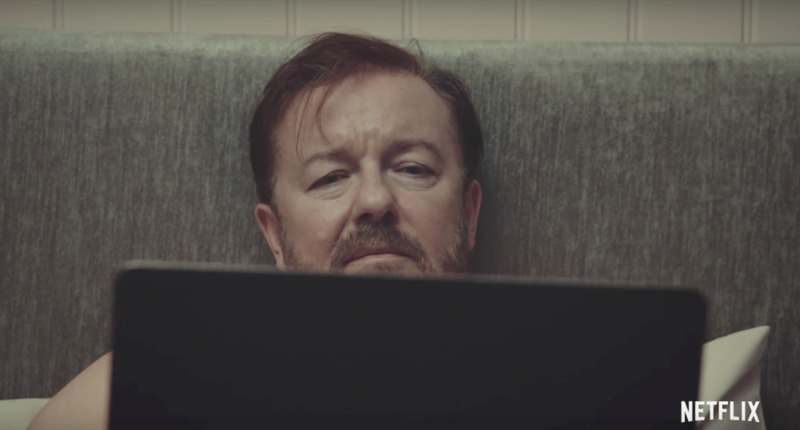 My wife and I recently finished watching Ricky Gervais’ new series, “After Life” on Netflix. The first season follows a journalist at a small, local paper played by Gervais who recently lost his wife to cancer. He spends most of the season being mean to others and moping around. If that sounds depressing, it’s because it is, but in this really beautiful way. I think no harm can come from discussing taboo subjects and my only duty is to do it honestly. I just think, ‘I want to keep pushing it a little bit more’, because the problem comes when you discuss these subjects if you water it down for people because you think they can’t take it. And that’s offensive. It’s hard to explain what this show meant to me without spoiling things, (which I won’t do) but he achieves on a TV-level what I felt on a movie-level with the movie HER with Joaquin Phoenix. There aren’t many released, works of art on this planet that can transcend your reality completely and cause you to fully commit to a character while feeling what they feel in such an absolute way. This is what makes an amazing story and in my opinion, Ricky Gervais was able to achieve this with After Life. I found my self laughing and tear up throughout the season. This seemed me to be achieved with not only proper character development and a wonderful story structure, but with the show’s music scoring. I’d be remiss in this article if I didn’t include the somber and at times, upbeat soundtrack that really fuels the mood of this entire series. Below you’ll find a Spotify playlist collected from each episode. Another aspect of the show that makes it so great, (besides Ricky’s performance) are the other actors that pop up throughout season one. As you can imagine, working at a newspaper can create some interesting interactions with odd personalities in the office and outside. This aspect of the show really helps move the story along and push our protagonist into feelings he may not always be ready to face or experience. Two relationships in particular really got to me. If you’ve seen it already, the first is referring to his friendship to the man who delivers newspapers. I’m very interested in how many viewers viewed Gervais’ interactions with this person, as it poses somewhat of a moral dilemma and speaks to a larger issue. The second is his contact with his father - a situation we all might have to deal with one day. If I really dove deep into each episode and character that I enjoyed, I would probably write a novel on the series as to what it meant to me as a whole and how it has impressed upon my view of death of a loved one. I promised no spoilers in the title though and I meant it. Is 'After Life' the best new Netflix show of 2019? It’s a little early to tell since we’re just about to enter April, but I can confidently say that it’s one of the best shows Netflix has to offer to date, (and that’s some stiff competition). Go watch it and you be the judge.